TROX and ceiling systems specialist Armstrong have been business partners for a number of years. Their successful cooperation has led to the development of new solutions in the field of air distribution, such as air terminal devices for the TECHZONE™ ceiling system. With integrating existing standard products a major goal, Armstrong has recently re-engineered its TechZone ceiling system. This includes the suspension systems as well as the technical components. TROX, who is the preferred Armstrong partner for air distribution, has now adapted its VSD35 slot diffusers to the new ceiling system. The slot diffusers have been fitted with a special frame that allows for an aesthetic integration with TechZone. Slot diffusers that fit grid size 1200 mm are available as single diffusers or as continuous run sections. From the technical point of view the 1-slot, 2-slot and 3-slot variants are no different from the standard products. 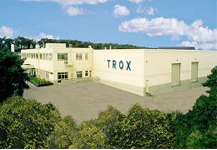 Volume flow rates range from 29 to 357 m³/h, while the cooling capacity varies between 78 and 952 W. Design and sizing are best done with the TROX Easy Product Finder design software. Inconspicuous integration of technical components: The TROX slot diffusers made of high-quality extruded aluminium sections blend in perfectly with the TECHZONE™ ceiling system.